On this bounce house, participants are welcomed by Ariel, Cinderella, Tiana, Belle, Jasmine, Aurora and Snow White, all ready for the ball. Visitors will rule this bouncy house kingdom, with plenty of room for bouncing fun all day long. 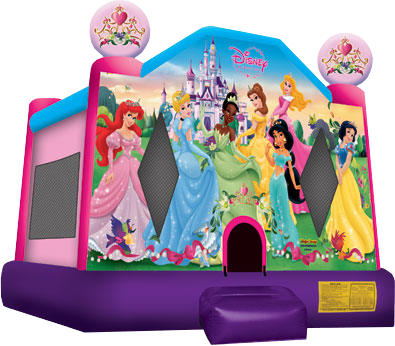 This bouncy castle will make your little girl transform into part of her disney princess party theme. Cotton candy, tables and chairs, some party supplies and this princess party it's ready to go! SEE A VIDEO OF THIS DISNEY PRINCESS BOUNCE HOUSE.